..making the Puerto Rican hills, and the Puerto Rican heart–ring! Puerto Rico country side. Copyright Ansonia Records. The traditional music of the jíbaro, or Puerto Rican country man, evolved from the music of the soldiers, farmers, artisans and enslaved Africans that settled on the island at the dawn of the seventeenth century. These ancient colonists hailed from the southern region of Spain, the provinces of Andalucía and Extremadura; from the Canary Islands; and from West Africa. From Spain they brought the traditional romances, song genres such as the Seguidillas and the Copla, and other traditional songs of ancient moorish descent. The Canary Islanders brought their diminutive timples and the Africans brought their memories of syncopated rythyms, drums and memories of their stringed instruments they made from gourds. Many eventually became established in the mountainous interior of the Island, and in those isolated hills their music developed a charming and unique character. 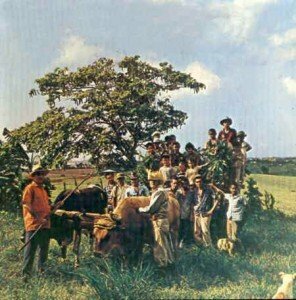 These became the first Puerto Ricans. From those same hills emerged our first cantaores, singers that remembered the traditional chants and sang them during festive occasions. Also those hills produced the first trovadores–poets who sang their poems. Their poetry was structured along the lines of the ancient Spanish décima: each line consisting of seven, eight or nine syllables–depending on complex rules. The music playing behind the singers was usually the seis. And each seis according to its region. Scores of different seises have been created all along the Island countryside. Among them the slowest, the seis mapeyé, the seis andino and the seis celinés ; and among the fastest, the seis chorreao and el seis zapateao. The music was produced by an ensemble consisting of a cuatro, a scratch gourd called a guiro, and a guitar or another native instrument such as a diminutive tiple or a large bordonúa–the last two instruments having all but disappeared from the scene. This ensemble was know as an orquesta jíbara, or jíbaro orchestra. And this has been the basis of the Puerto Rican traditional instrumental folklore. Music of the Puerto Rican Countryside was written by The Cuatro Project, a volunteer-based, non-profit organization based in Northampton, Massachusetts and Moca, Puerto Rico, which has dedicated itself since 1992 to study, preserve and promote the musical and musical-craft traditions that surround our “national instrument”–the cuatro–and besides, the traditions of the family of musical instruments created since the 18th century in the central mountainous region of the Island by the Puerto Rican jibaros. The website of The Cuatro Project is http://www.cuatro-pr.org/. 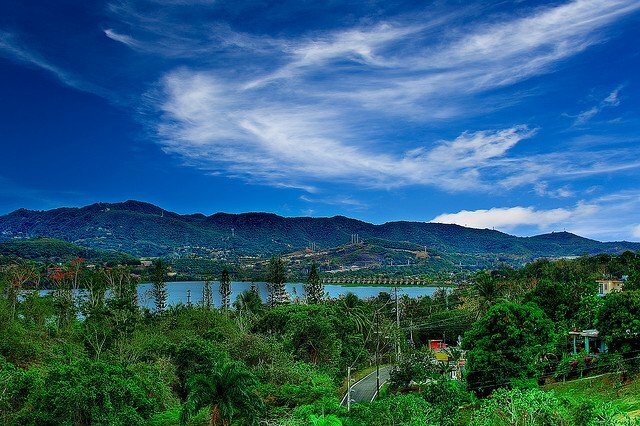 The featured image in this article is a picture by Roberto de Jesús Navarro, and is a view from his mother’s house in the mountains of Barrio Corillo in Villalba, between Jagueyes and Romero. You can see more pictures by Jesús on Flickr. © 2014 – 2017, prismusic. All rights reserved.